Special Two Gomers Announcement and New Years Challenge! It’s been a year and a half since our last fundraiser, and we devoting January to raising funds so we can keep the lights on without adding ads to the podcast! 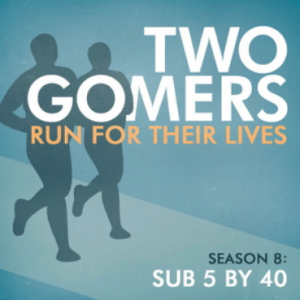 If the Two Gomers have inspired, informed, or entertained you in the past 18 months, would you consider giving toward costs to keep the podcast going? We appreciate everything you do for us, GomerNation, and we look forward to keeping the podcast available on iTunes for years to come! Hello Beloved Gomers! This is Gomer 27. Is there any way to convince you guys to sell new hoodies? Mine is so loved that the zipper pull is broken and the sleeves at the cuff have holes. I picked mine up from you in Minneapolis at the dreaded Sub 5 Strive. (I finished in 6:00:01) I still wear it frequently but I would love a new one to show off. What do you think? Fundraiser!! !